Portmanteau was formed in French by joining porte (porter ‘carry’ in imperative mood) to manteau ‘cloak’. Borrowed into English in the mid-16thC, it originally meant (and can still mean) a bag or case for carrying clothes or other items. ‘I see it now,’ Alice remarked thoughtfully . . .
A little later, Humpty Dumpty adds that mimsy ‘is “flimsy and miserable” (there’s another portmanteau for you)’. 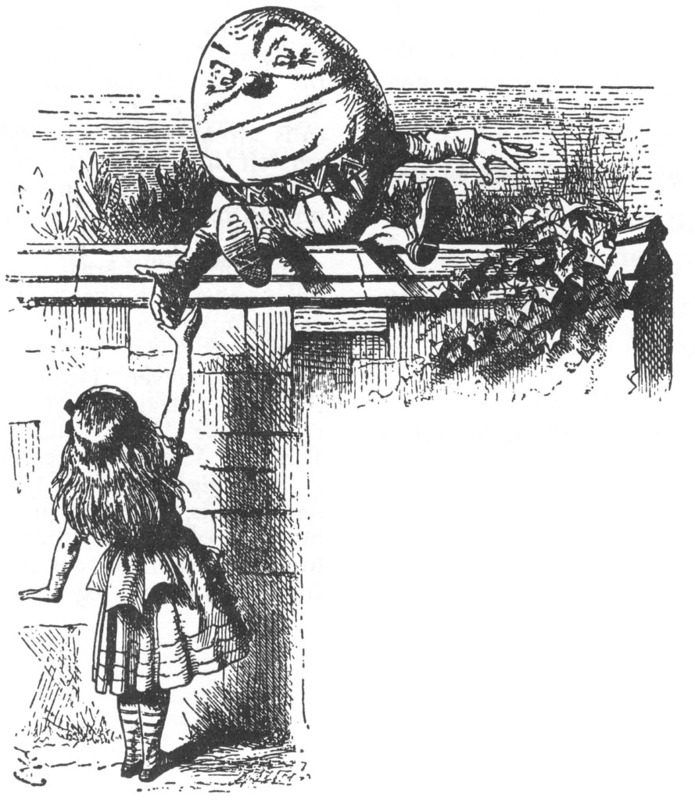 Carroll, via his anthropomorphic egg, was the first person to use portmanteau in this linguistic sense, and the popularity of his Alice books helped the label to stick – though linguists often call them blends instead. Slithy and mimsy never gained much currency, but other Carroll-coined blends, like chortle, have done better. (Side note: a phrase in Carroll’s first Alice book gave this blog its name.) Carroll’s linguistic style was a curious mix of playful and rigorous; for all his inventiveness he could also be prescriptive about English usage. But then he was never one to chillax. This entry was posted on Thursday, August 2nd, 2018 at 6:51 pm and is filed under humour, language, morphology, wordplay, words, writers. You can follow any responses to this entry through the RSS 2.0 feed. You can leave a response, or trackback from your own site. Got one wrong, plogging. Who’d a thunk. Fun! Did the other quizzes too. Always love a challenge. Thanx! You’re welcome! Yes, the other quizzes are fun too. I’m sorry to hear that. The quiz appears on both pages that you link to, so maybe your browser is not displaying it for some reason. That was fun! I got 60%. I knew a couple and frankly guessed the answers to the rest of the Portmantiz . Some of them are pretty obscure! Sooner or later there has to be guessing. Thanks for trying the … bliz. Got 8 out of 10, but technically the right answer wasn’t a choice for “plogging” since it’s actually “picking + litter + jogging”. “Slithy” is an unusual one, isn’t it? How many other portmanteaus are there where the beginning and end come from the same word? That’s true about plogging: the middle word should also appear among the constituent words. I’ll see if it can be updated. And that’s a good question. I think I’ve seen others like this, but infrequently, and I can’t think of one offhand. Thanks, Deb! That’s a decent score, given how new or little know many of them are. Got 10/10, but I was not familiar with about half of them, so I was very lucky. However, in all 10 questions, the three options provided all had an air of possibility about them, eg for ‘lunner’. When I didn’t know for certain, I puzzled for a while. It was a surprise when all turned out to be correct. Impressive result! I’m glad to hear the alternative answers all had that elusive ‘air of possibility’, but delighted that you worked them all out. 9 out of 10, with Plogging the mistake. Most of those correct were guesses, however. Great fun. That’s great guessing. Plogging is quite an odd one, even in the context of strange blends. Ahoy, matey. I got 80%, pretty good for a guesser. Thar be only a couple that I be sure about aforehand. I be loving me a good portmanteau word. It be saying so much more than the individual words theyselves. Good score! Glad you enjoyed the quiz.